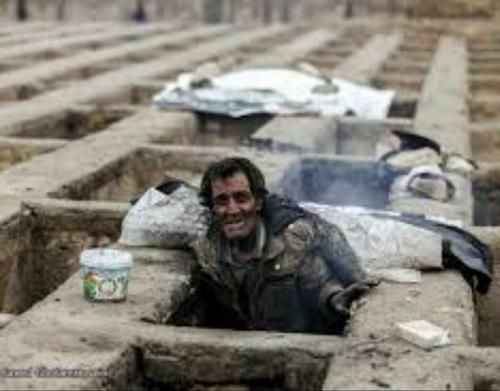 A poor man living in empty graves in one of Tehran’s grave yards. In the first week of September, Iran’s Supreme Leader Ali Khamenei addressed the regime’s Assembly of Experts, asking them to lie about the dire economic condition in order to escape the public’s reaction. He talked about how officials should handle the economic crisis and warned that the plight of the Iranian people should not be overstated! Khamenei used his address to call on senior officials and remind them that pessimism should be kept to a minimum publicly. On the Supreme Leader’s official website, the statement blamed exaggeration about the economic crisis for intensifying “the anxiety of public opinion”. The statement also said exaggeration “causes the pessimism virus to spread. It is not correct to speak in a way that the audience is terrified and thinks that all is lost”. It appears that Khamenei would rather see the dissemination of lies and falsehood, than accurate reporting about the dismal state of the Iranian economy. "Urgent kidney sale – Blood type A+ – Tested – Male, 31, young – To pay for mortgage & education fees – Urgent – For Sale"
The economic crisis in Iran has been intensifying for months. The value of the rial plummeted after the US reintroduced sanctions against the Iranian regime. Following the United States’ withdrawal of the 2015 Iran nuclear agreement, the Trump administration made it clear that any company doing business with Iranian regime would lose access to the US market. Faced with the choice between Iran and the US, many companies and multinationals cut their business ties with Iran. Retired workers & long-term nurses protesting poor living conditions & seeking answers to their demands. The Iranian regime attempted to mitigate the losses by appealing to European governments to stop the international exodus from Iranian markets. But Rouhani and Khamenei’s attempts did not yield results. European nations had no desire to enter the dispute on the side of the Iranian regime and risk their own access to the American market. However, the economy was already in turmoil. Years of economic mismanagement at the hands of the mullahs and systemic corruption has hollowed out the Iranian economy and the country’s financial institutions. All across Iran, livelihoods are being lost. Goods are becoming more expensive, and poverty levels are soaring. So far, the government’s attempts to stop the free-fall of the rial have proven ineffective. Since the economic crisis began, the regime officials have done everything they can to ignore the problem or pass the blame onto another party. They have attempted to lay the blame on the activities of foreign powers, but the mullahs only have themselves to blame. The regime has systematically funneled billions of dollars out of Iran, supporting militia groups and terrorist organisations across the Middle East. This money could have gone towards alleviating the economic pressure of the Iranian people. Regime officials have ignored pressing social and environmental issue plaguing Iran for years. They have been content to divert money into their own pockets at the expense of the population. During his speech, Khamenei said, “no government can go on without the support and trust of the people”. 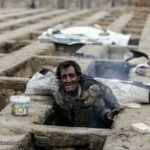 He knows that the mullahs’ day of reckoning is coming. All that remains to be seen for how long the regime can hold on.